Birds will go crazy over these Sunflower Seeds. Texas Farm to Texas Feeder-Locally grown ingredients Black Oil Sunflowers are produced under irrigation, insuring a beautiful shiny black shell and full hearts inside. 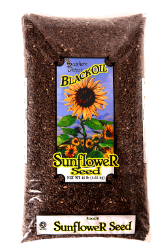 Birds will go crazy over these shining heavy oil content Sunflower Seeds.